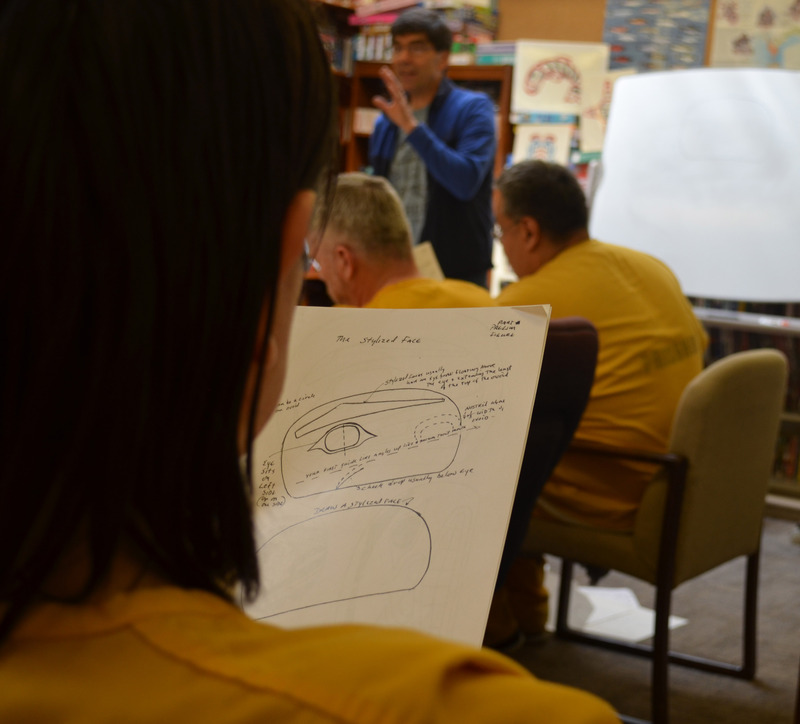 Tsimshian artist and teacher David A. Boxley just wrapped a pair of intensive, weeklong workshops on formline design and Tsimshian language in Juneau. 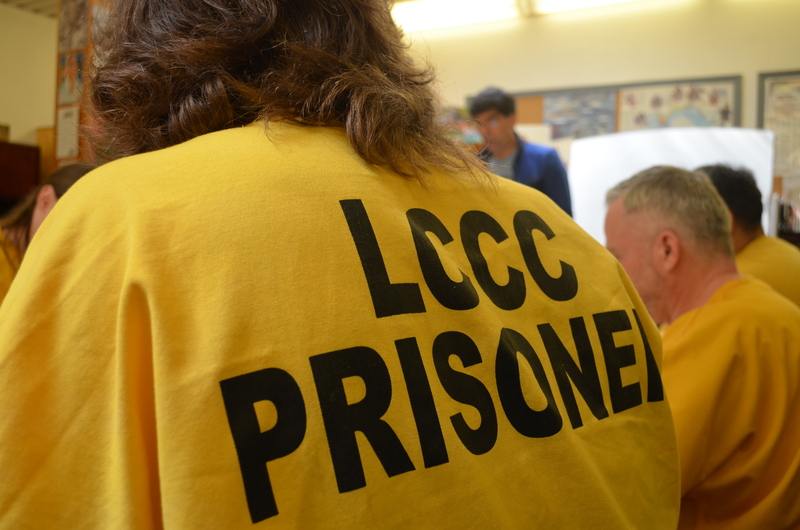 He’s been at Lemon Creek Correctional Center teaching formline by day, and at the Walter Soboleff Building teaching Tsimshian language by night. Entering the maximum security prison—with its checkpoints, razor wire barricades, metal detectors and armed guards—it’s hard to imagine an art class. Until you get to the library. “I have nine hard-working fellas sitting around a big conference table with elbows flying, and pencils and erasers moving quickly, and they’ve got templates, and booklets with all the information and diagrams to help them produce the eagles, ravens, wolves and killer whales that they’re working hard to produce,” says Boxley who is best known in Juneau for the two-story high clan house front he made for the Walter Soboleff Building. The men wear bright yellow prison onesies and are of diverse cultural backgrounds. They look focused and work silently. Colorful examples of formline art are taped to the shelves of books, and natural light filters in through two skylights. Boxley circles the room observing the students’ work. 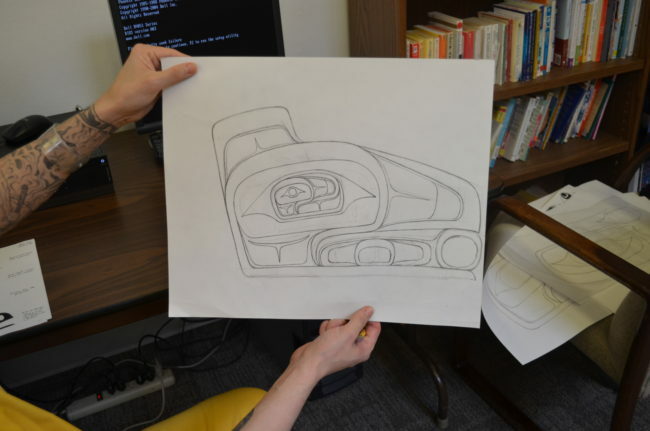 Among them is aspiring Tlingit artist William Littlefield from Sitka. “There’s been a few people that has been willing to teach me this but they don’t break everything down like how David has,” says Littlefield, who wants to make art and teach professionally when he gets out. Boxley and class sponsor Sealaska Heritage Institute want to help artists like Littlefield improve their formline design. Once the 7-hour formline class is over, Boxley heads downtown to teach Tsimshian language for 3 more hours. Close to 20 people have gathered in an empty office space at the Walter Soboleff Building. Boxley has labeled most objects in the room in Tsimshian, and two tables of props for games and activities stand before them. While art and language are related, Boxley says they’re in different states. “Our art is flourishing. There are hundreds and hundreds of people from different tribes from Yakutat to Seattle who are producing art,” says Boxley. The language is a different story. Boxley says there are only 50 fluent Tsimshian speakers left. “Our language is extremely threatened, I mean beyond extremely threatened,” he says. After instruction from Boxley, the students break out into small groups to practice introductions. David Russell-Jensen is Tsimshian Killer Whale with roots in Metlakatla and now lives in Juneau. He goes to the University of Alaska Southeast. While studying Tlingit there, he learned about Boxley’s class. “I think it’s important to be connected to the land you live on but also it’s very important for me to be learning my language because it’s not in that great of state right now so, hoping to work on that,” says Russell-Jensen. 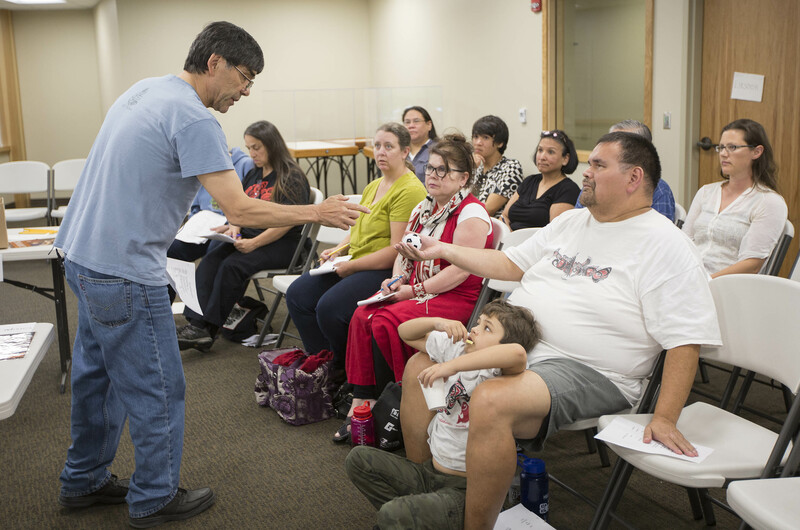 Russell-Jensen embodies Boxley’s hope for the future of Tsimshian language. “You know it’s not our fault that we speak primarily in English these days, but it will be our fault if the last speaker dies and no one else can do it,” says Boxley. 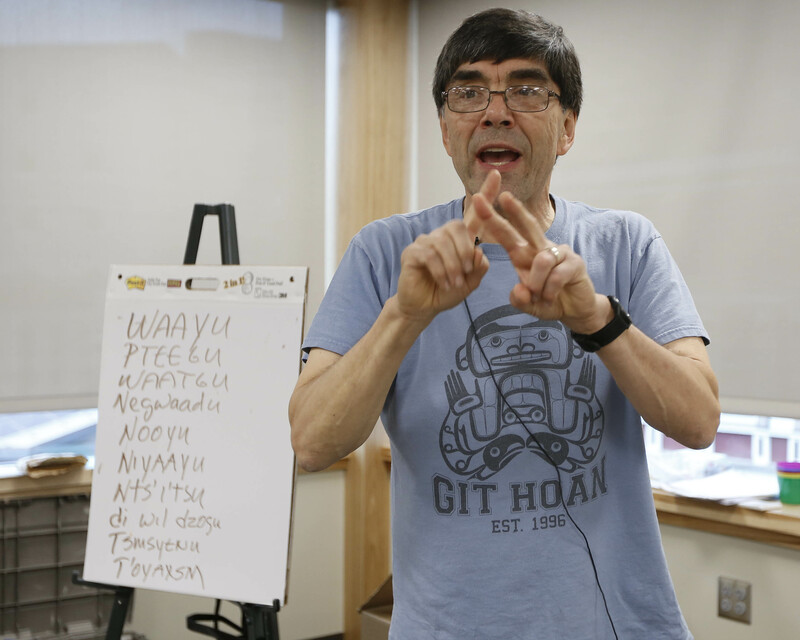 Both Boxley and the Sealaska Heritage Institute hope to do more Tsimshian language classes in the future. Boxley’s next gig is at home in Washington state, where he’s teaching a mask-making workshop.